Indiana Jones Adventure is an excellent motion base ride in Adventureland and one of the best attractions at Disneyland. The minimum height to ride is 46 inches. 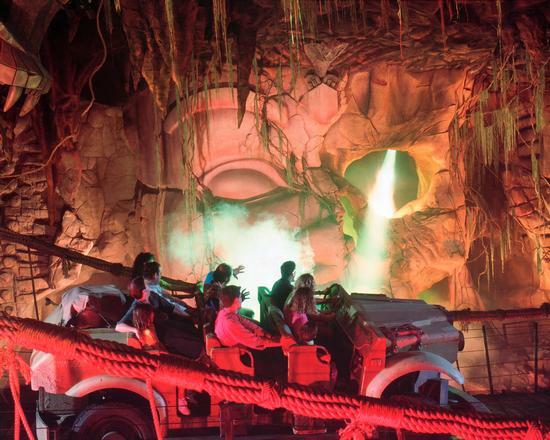 Indiana Jones Adventure: Temple of the Forbidden Eye is a dark ride attraction at Disneyland. It opened on March 3, 1995. Based on the Indiana Jones films, guests are taken on an adventure in modified military transport vehicles through an ancient Indian Temple with Indiana Jones. It was formerly sponsored by AT&T, where cards to translate symbols (Mara-glyphics) on the walls were handed out. This ride has an intricately detailed queue taking explorers through much of the temple. A nearly identical ride entitled Indiana Jones Adventure: Temple of the Crystal Skull is located at Tokyo DisneySea theme park in Tokyo, but takes you through a South American Temple with minor changes to the ride. Although this attraction is known to break down frequently, this is near perfection. Without the need of 3D glasses, this attraction takes you through an adventure from beginning to end. Even the queue is perfectly themed. When all the elements are working this ride can't be beat. It's a perfect length with a great soundtrack and finale and I love it.